One of the best spaces for adults on the Disney Fantasy is the Quiet Cove Pool. The Disney Fantasy Quiet Cove Pool is a place where you can escape the kids completely. The Quiet Cove Pool is reserved for guests over the age of 18 on the Disney Fantasy. 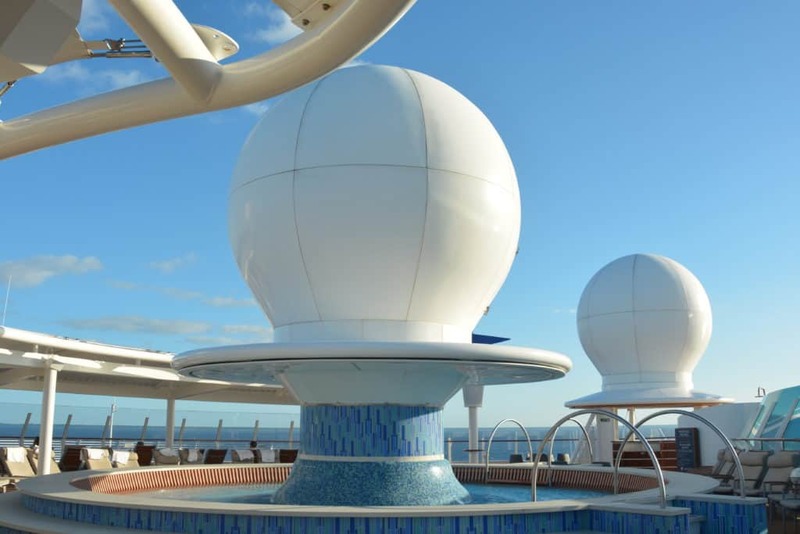 The Quiet Cove pool area is on Deck 11 of the Disney Fantasy. It feels satisfyingly separate from the bustling and loud areas of the family and kids pools. If you want to escape for a while you should make the Disney Fantasy Quiet Cove Pool your first stop. It’s great to get some time to relax without the kids sometimes! Disney are one of the best cruise lines for actually making a good amount of space for the adult guest. They actually seem to have almost overdone it on the Disney Fantasy. The other pool areas of deck 11 are ridiculously crowded and the pools very small. They have taken a large amount of space and devoted it to the adults only space. We wonder whether the design of the three new Disney ships will incorporate such a large adult space. We certainly hope so! The Disney Fantasy Quiet Cove Pool is a great place to relax. However, if swimming for exercise is your think you are probably going to be disappointed here. The Quiet Cove pool is a strange shape. It’s 3 semi circles joined together. One of these areas is shallow and has seating. It is directly in front of the bar. There are six bar stools in front of the curved bar. It is a lot of fun to sip your favorite cocktail with your feet in the water. Even if it does have to be in a plastic glass! The other two semi circles are deeper water. The area isn’t huge, but doesn’t often feel crowded. It’s the kind of area where you can either keep to yourself or start a conversation with someone. Swimming around too much isn’t really a great option unless you are the only one in the pool! You will want to check out the two glass bottomed jacuzzi. This may seem a little scary at first.You can see all the way down to the ocean through the floor of the jacuzzi. It’s something that you need to do at least once, but the novelty wears off pretty quickly. Cove Cafe is located steps away from the Quiet Cove pool. This is a great place just to sit and relax. This is a beautifully designed space. It has the feel of an upscale cafe with a lot of brown colors and sumptuous seating. It is a great place to spend some time relaxing, particularly if you are in the heat. It is a great place to escape into the air conditioning. If you want a drink in Cove Cafe you will have to pay for it. If you are a serious coffee drinker you will probably want to get the coffee card. If you pay for five drinks you get the sixth one for free. There is free coffee available on the ship, but it really isn’t great. They now serve Joffrey Coffee instead of the Nescafe that they served for years. It is a small improvement! The Cove Cafe also serves pots of tea. I have to say that $4.25 for a pot of tea even if it is Floral Jasmine or Russian Earl Grey. A Cafe Late is $2.95 and a large Macchiato is $3.25. If you prefer your coffee alcohol infused why not try a Mint Mocha Latte with Creme de Menthe for $6.25. Cove Cafe also has an alcohol menu which includes Single Malts starting at $7.25. There is a small selection of wine which starts at $5.75 for a Prosecco or Pinot Grigio. One of the great features about the Cove Cafe is the free cakes and pastries which are available all day. Just in case you are every hungry on your Disney cruise! Another great area which is reserved for adults only on Disney Fantasy is Satellite Falls. This was a feature which is unique to Disney Fantasy as it is not on the sister ship Disney Dream. There is a very large sun deck area which is usually not very busy at all. This can be a great place to grab one of the sun loungers and relax. Satellite Falls is a circular pool of shallow water with a water fall feature. It is a great place to cool off in the heat. This video shows the Disney Fantasy Satellite Falls area. 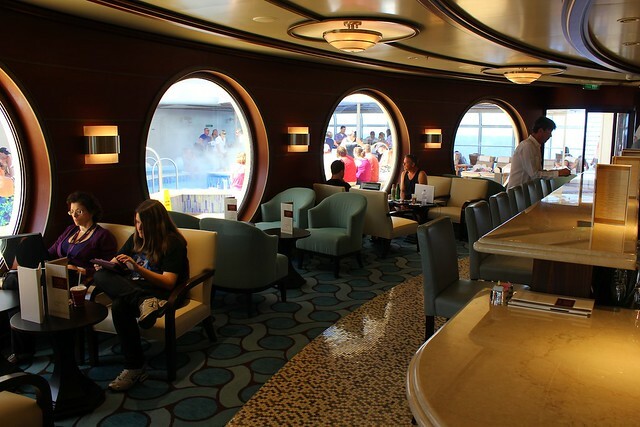 What is your favorite adults only area on the Disney Fantasy? 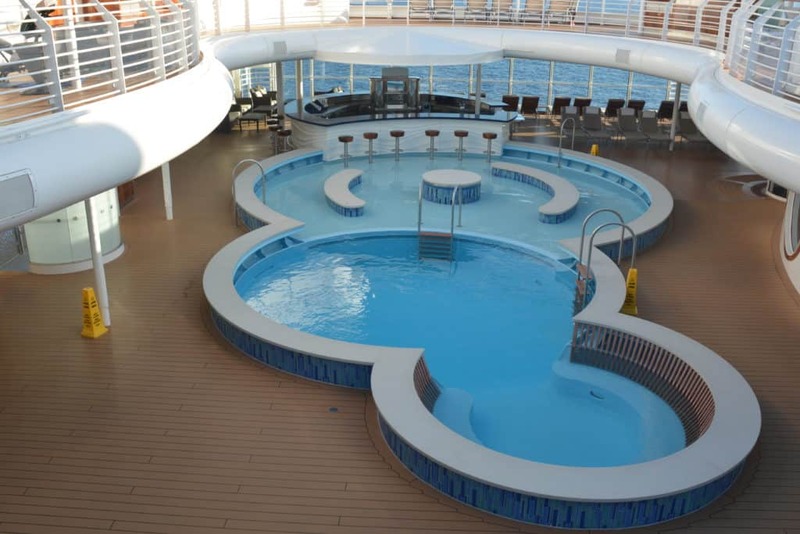 What do you think of the Disney Fantasy Quiet Cove Pool?